CoScripter is a system for recording, automating, and sharing actions performed in a web browser. CoScripter lets you make a recording as you perform a procedure, play it back automatically in the future, and share it with your co-workers. The Activity-Centric Computing project is defining a new organizing framework for supporting collaborative work around the concept of human activity by creating a unified activity representation, architecture, and user experience. 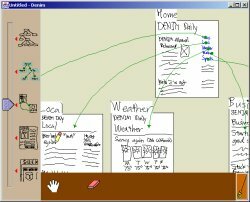 Damask is a prototype system that uses design patterns to help support designers in the early-stage design of user interfaces targeted at multiple devices, such as desktop PCs and mobile phones. DENIM is a prototyping tool that helps web site designers in the early stages of design. DENIM supports sketching input, allows design at different refinement levels, and unifies the levels through zooming.